David O. Russell is one of those filmmakers who started off a little rough with films like Three Kings and I Heart Huckabees – both of which cemented his reputation as being a difficult director to work under; just as George Clooney or Lily Tomlin – but then picked himself up with a few consecutive critical and box office hits including The Fighter, Silver Linings Playbook and American Hustle, all of which were nominated for Best Picture and gained Russell at least two writing nods and three ones for directing. A process like that would drive anybody’s confidence through the roof, and once they get the feeling that they can do no wrong when everybody seems to love what they do with virtually no limitations, suddenly they feel like they can make the most bizarre, most unfocused and most lacking in any sort of substance whatsoever film and still be showered with the same praise they had received. Such a fate that once met the likes of M. Night Shyamalan now falls upon Russell with Joy, a film that’s supposed to be the story of how Joy Mangero (portrayed in the film by Jennifer Lawrence) successfully became a multimillionaire and entrepreneur after inventing the self-wringing Miracle Mop, but is instead a flimsy exercise for Russell to flaunt his directing style and writing structure in ways that both isolate and irritate anybody who watches it. From the opening ten minutes, you can just feel the ego accelerating in full force as we are vaguely introduced to people we don’t know, don’t care about (or at least the script gives us no real reason to care) and instantly don’t like. It seems as though every person in this film apart from Jennifer Lawrence is an obnoxious caricature, whether it’s Robert De Niro’s temperamental and philandering father, Édgar Ramírez as Joy’s supportive ex-husband who’s still living in the house for some reason, Virginia Madsen as Joy’s mother who’s a soap opera-obsessed shut-in with comically oversized glasses, and the list goes on. Nobody gains any sympathy because they’re all so griping in their own unique ways, and they’re so underdeveloped as characters it’s nearly impossible to understand their actions as making any kind of sense whatsoever. So little attention is given to making these characters seem relatable or even likable, which means that ultimately the overall style must at least be strong enough to support it. However, it seems that Russell’s blissful ignorance has neglected this as well, because in regards to its tone, its focus and everything else, it’s a complete mess. The first half resembles more of a David Lynch film, being filled with just the most surreal imagery and blocking that you’d swear the theme for Twin Peaks was about to come onto the soundtrack – at least two fantasy sequences where Joy envisions herself and other members of her family in the rubbish soap opera her mother obsesses over are the tip of the iceberg – and then when it partially settles down as Joy begins to sell her life-changing Miracle Mop it’s like a half-arsed corporate thriller, complete with fraudulent swindling and contract disputes. In between, we’re treated to several narrative devices that go almost nowhere, such as intermittent narration by a character who doesn’t even make it to the end of the story they’re supposedly telling, extended flashbacks showing us information that really doesn’t come much into play at all throughout the rest of the movie, and sudden shifts from the “rags to riches” template to a sudden media satire when Joy begins showcasing her product on QVC under the guidance of Bradley Cooper’s exposition-spouting executive (Cooper, incidentally, constantly looks like he’d much rather be anywhere else other than here on set, and we honestly don’t blame him). It is, constructively and creatively, a complete and utter train-wreck that painfully needed to have been handled far better by its conductor to avoid such a pile-up in the first place. As for Lawrence, although she is undoubtedly doing her utmost to deliver a worthwhile performance – which is honestly the best thing about this movie – she simply can’t help but be miscast in the title role. The real-life Mangero was roughly in her mid-30s when she came up with the prototype for the Miracle Mop, and Lawrence – at least a decade younger than Mangero was at the time – still looks too youthful to convince as a divorced mother of two young children, let alone pass for a mid-30-year-old business head. Towards the end, when everyone, including her own children, is considerably older than when we first saw them, Lawrence somehow looks even younger and it’s incredibly distracting how much she doesn’t seem to fit the part. She gives a solid performance regardless, but she just wasn’t the right fit for the character she’s portraying. It’s frankly mind-boggling how someone like David O. Russell can let their heightened confidence run amok like this, because he had brought out some genuinely good films over the past few years – but Joy is overwhelmingly self-indulgent and a well-rounded argument for creative collaboration, which Russell seriously needs a joyful dosage of. 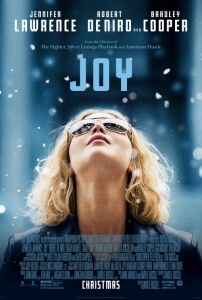 Joy is not only a bad movie both constructively and creatively, but it’s also a cautionary tale of what happens when a filmmaker swept up in their own hype gets far too much control over his own movie, and puts his obnoxious style first over making us care about the story or any of the characters, played by talented actors who are either sorely miscast – Jennifer Lawrence in particular – or would just rather be anywhere else other than working on this film. It’s utterly joyless.